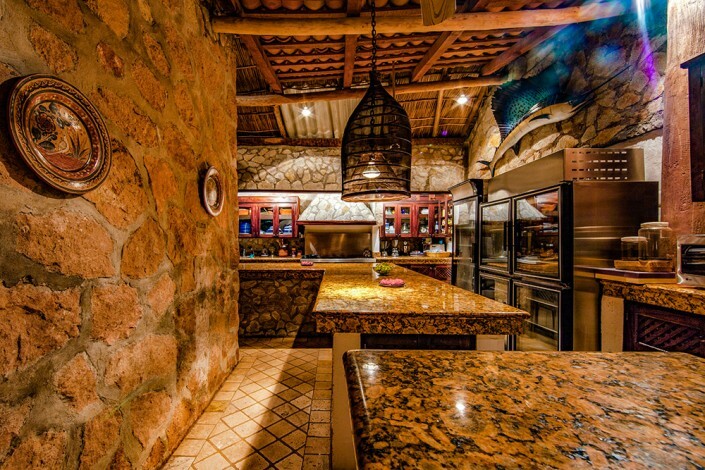 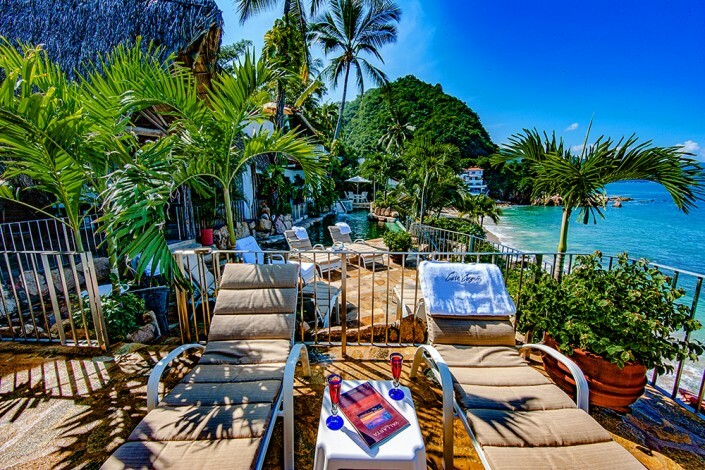 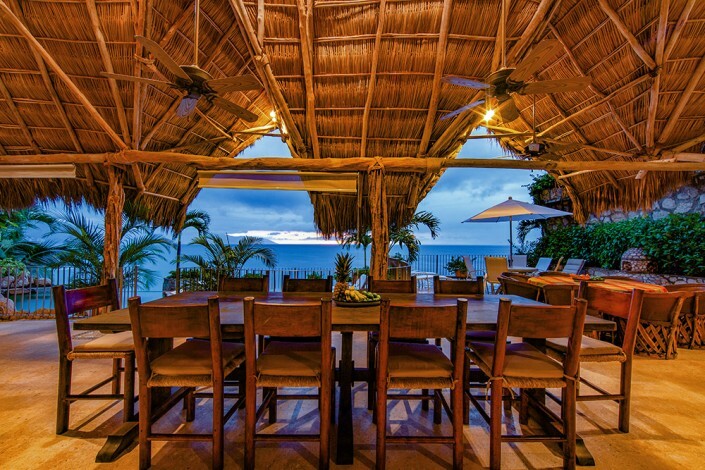 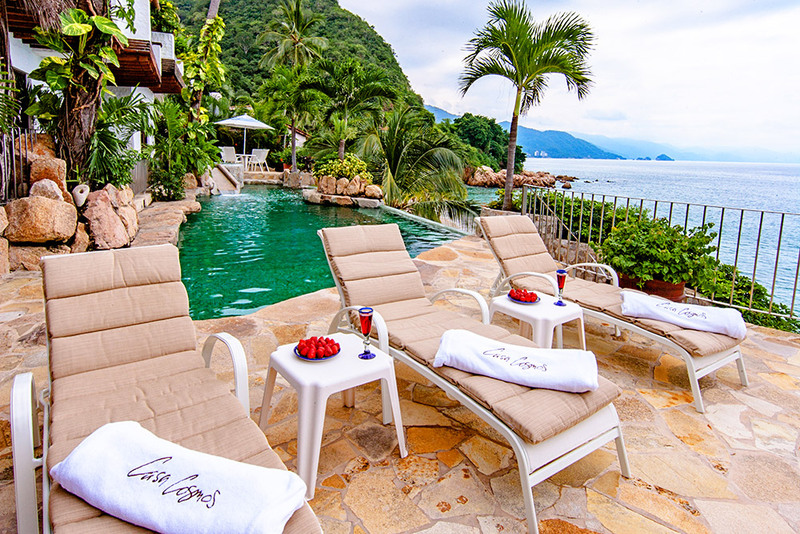 Casa Cosmos is a relaxed beach house just a few steps from the sand located 3 miles from downtown Puerto Vallarta. 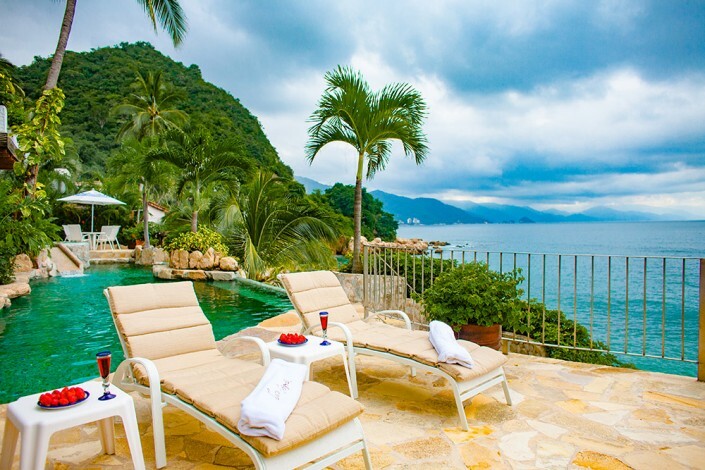 Offered as a 4, 5 or 6 bedroom villa and and includes a full staff . Casa Cosmos was built in the 1970’s with a traditional Palapa /thatched palm roof soaring 40 feet above the main open concept entertaining area with living dining and kitchen opening onto the pool and terrace with a white sandy beach and the sparkling Pacific just beyond. 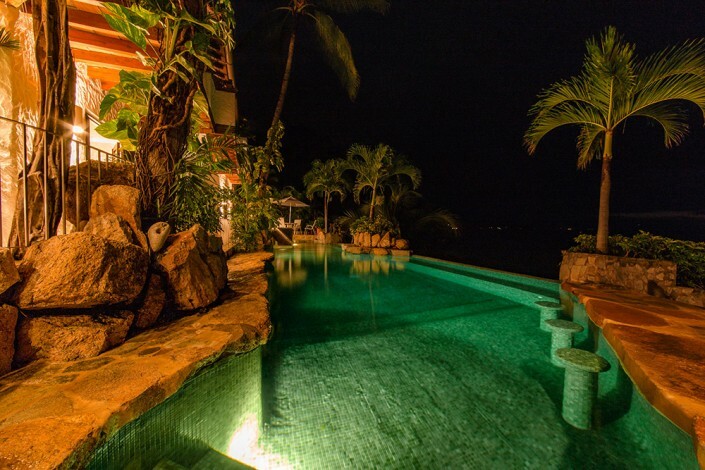 The casa has 2 pools the solar heated 50 ft long lap pool, a small plunge pool plus the rocky grotto with water slide & Jacuzzi. 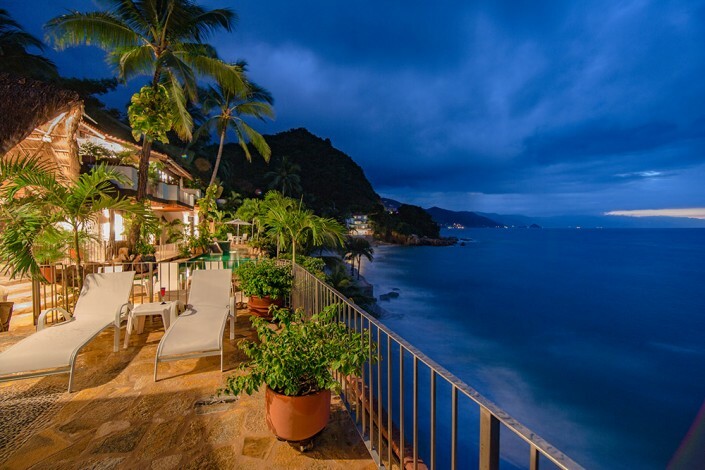 The views of the south shore are still almost unchanged from the time the villa was built, when John Huston and other Hollywood jet set were regular faces around town, the mountains of the Sierra Madre meet the Pacific Ocean covered with lush tropical rain forest. The beach in front of the villa has a semi private status with only a small group of private luxury villas sharing the small stretch of white sandy beach, with rocky outcrops on either end making a natural barrier. 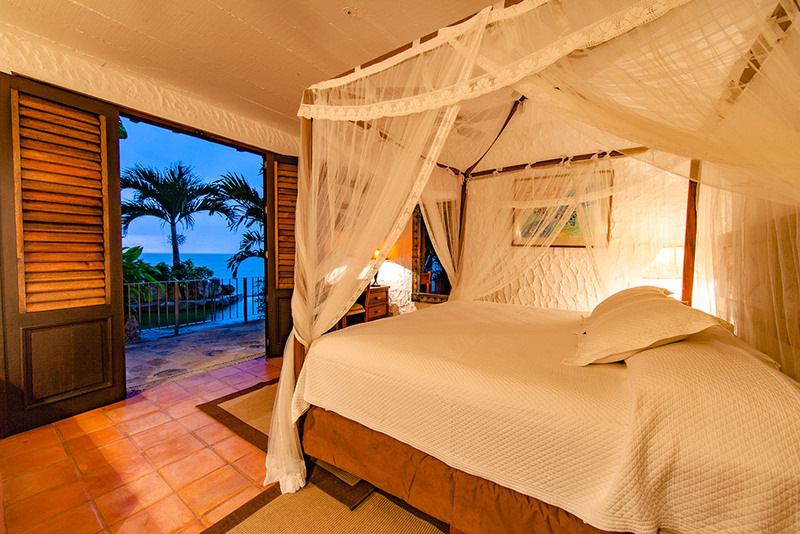 The villa includes two kayaks, hammocks and beach furniture. 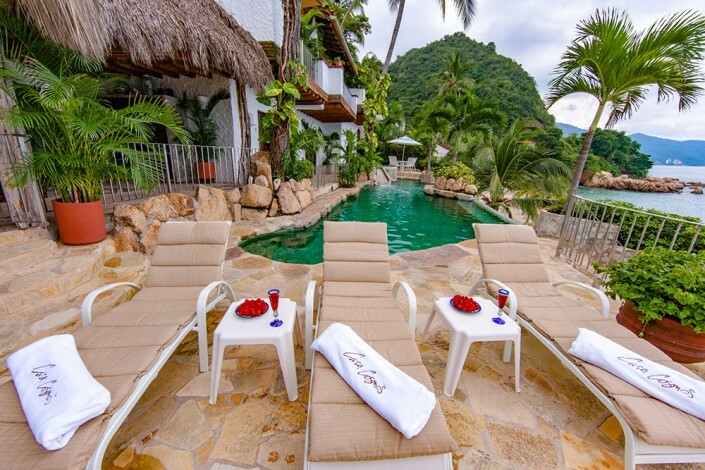 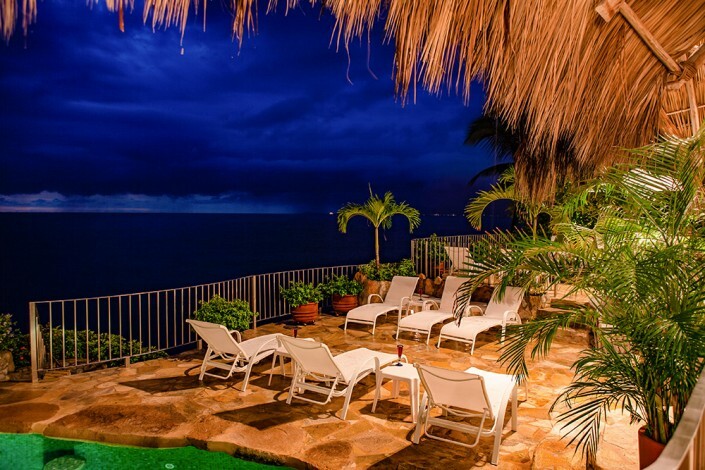 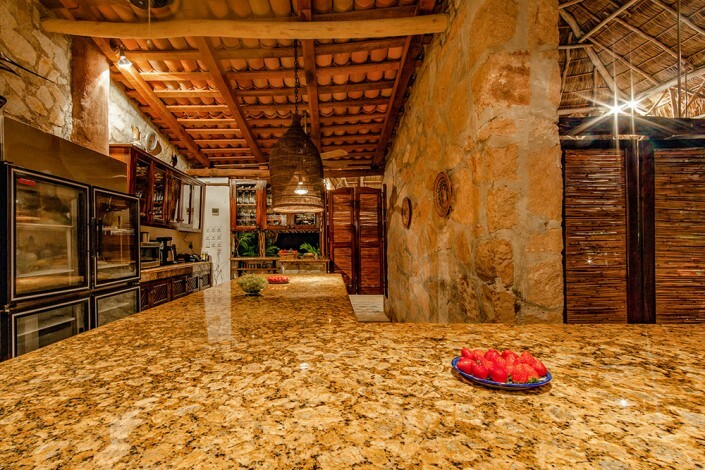 Casa Cosmos offers rentals starting with just four bedrooms, or adding up to extra upstairs bedroom, the Dormitory with 4 single beds (great for children or teenagers) or add on the Casita with kitchen, and private terraces. 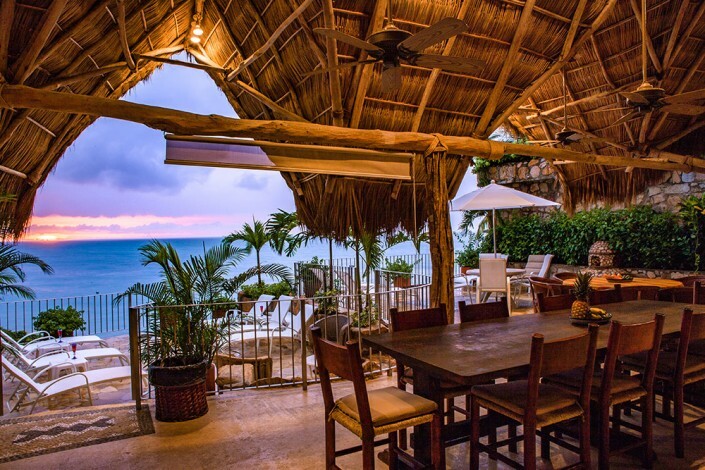 The 4 Bedrooms of the main house are on one level with full wall of louvered doors opening to the ocean breezes and views. 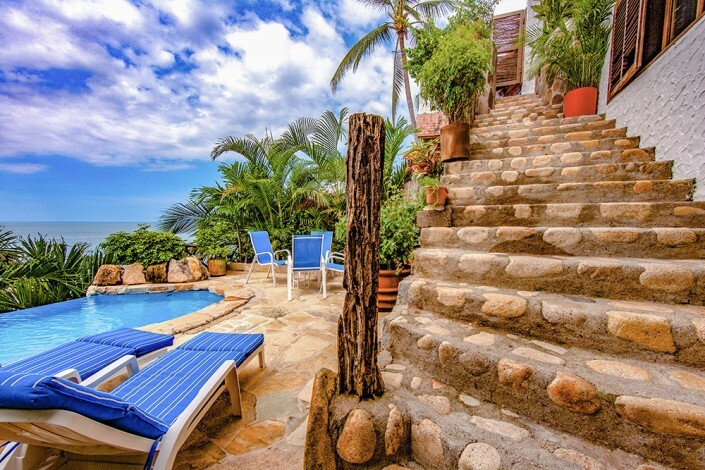 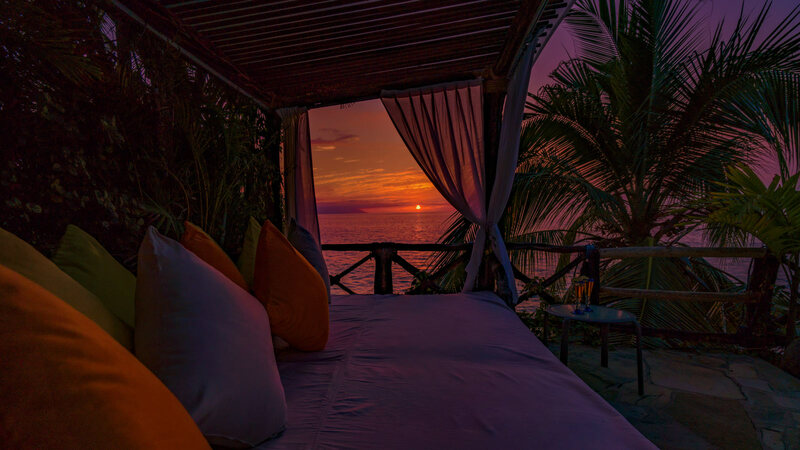 Enjoy living in the outdoors at Casa Cosmos, situated on a semi-private beach just 5 minutes south of downtown Puerto Vallarta. 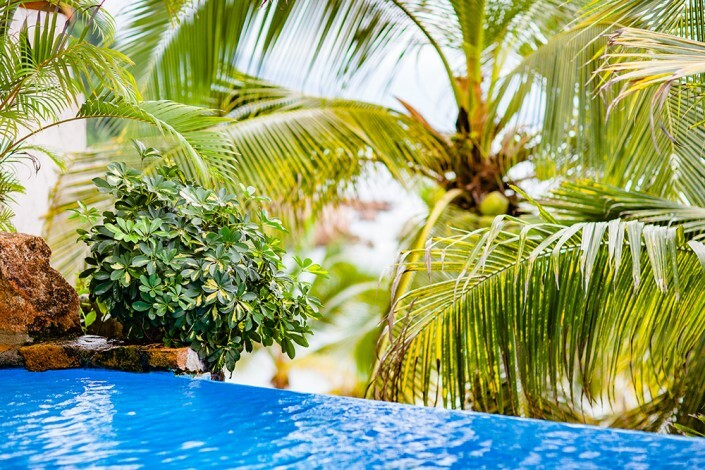 Each feature accentuates the beauty of the natural surroundings, from the lagoon-like pool to the large palapas. 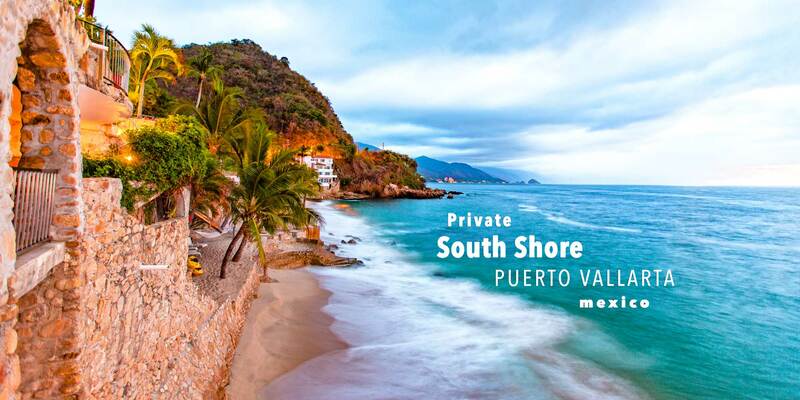 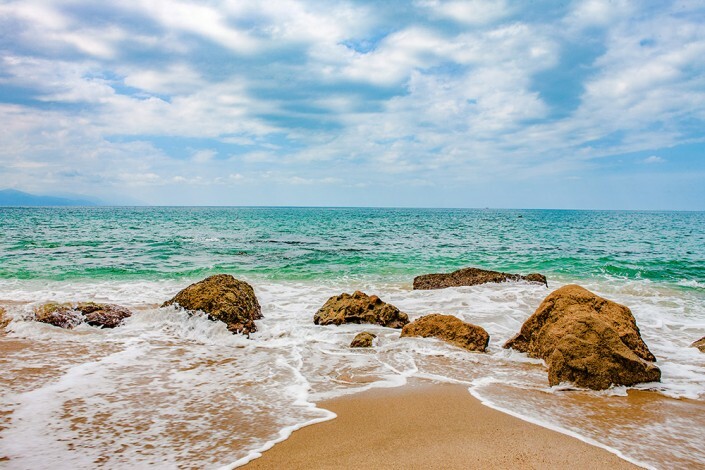 The sleepy fishing village of Puerto Vallarta started coming alive in the early 60’s when early adventurers and celebrities like Tennessee Williams started flocking to its near perfect weather and remote beaches. 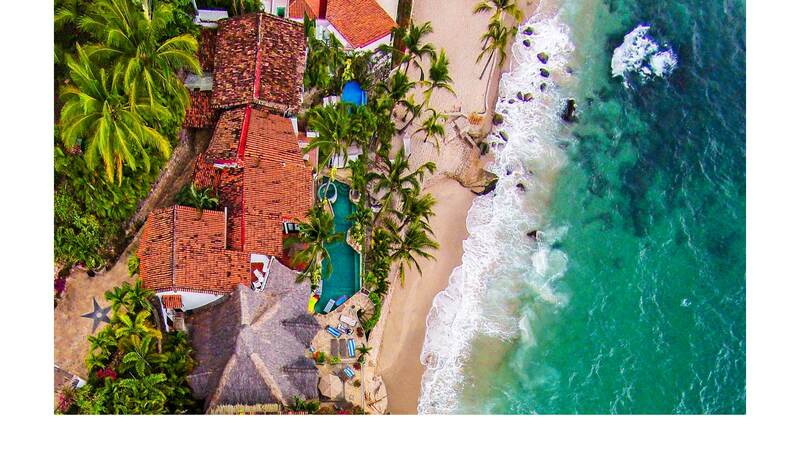 There were no real hotels then and so these expatriates first bought houses in town and then later encouraged local craftsmen to build romantic vacation villas such as Casa Cosmos just to the south as soon as the newly constructed coastal road opened up. Long before the advent of “eco-chic”, Puerto Vallarta’s pre-airport remoteness and difficult access required that these early buildings use local materials and employ environmental sensibilities: hand-hewn hardwoods from the local jungles, hand made tiles and brick, and native palm frawn thatch roof “palapas.” These first haciendas were actually rather simple almost colonial style buildings that used wood plantation shutter doors instead of sliding glass, wrought iron latches instead of factory doorknobs, and ceiling fans instead of air conditioning. 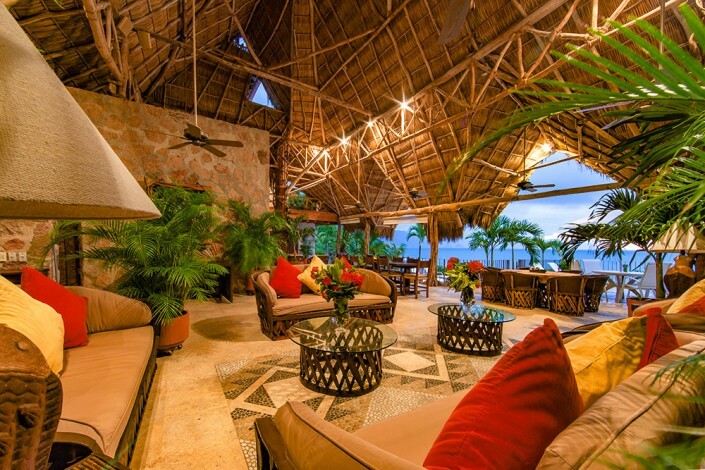 Casa Cosmos was built at that time by the late Mexico City society architect Alfredo Terrazes for his parents in his recently acquired exclusive private beach front family compound, sandwiched between his own house and that of his sister. 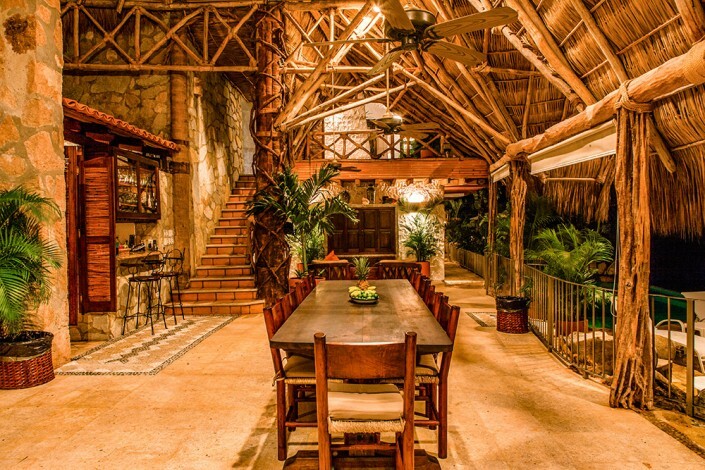 Sr. Terrazes was something of a celebrity himself having just designed American heiress Barbara Hutton’s Cuernavaca villa. 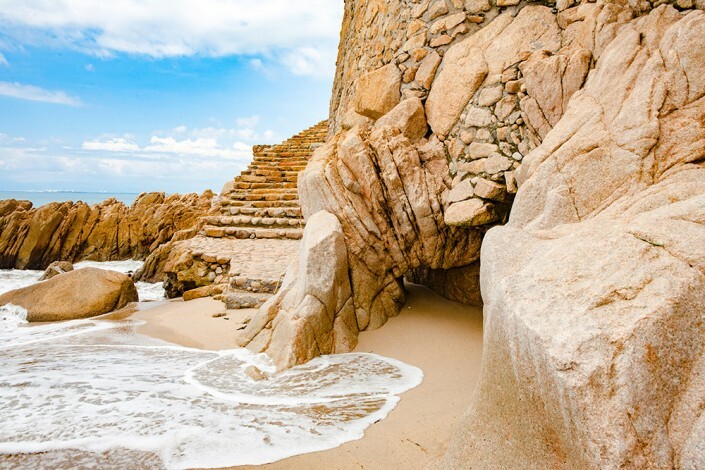 He later went on to become the initial architect of the nearby Camino Real Hotel (now DREAMS) on adjacent beach front he owned just to the north. 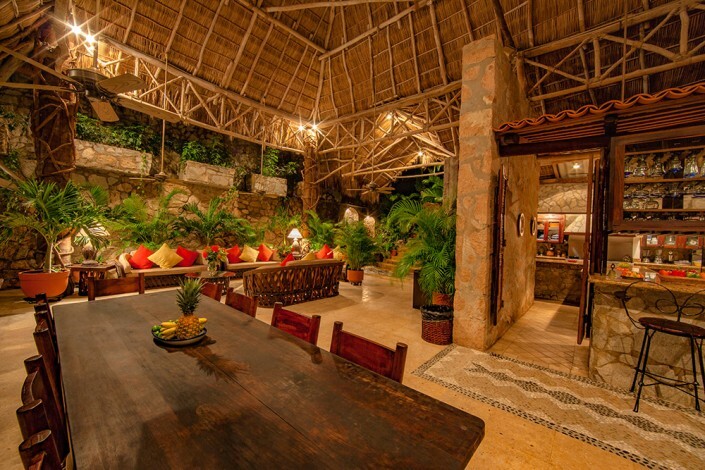 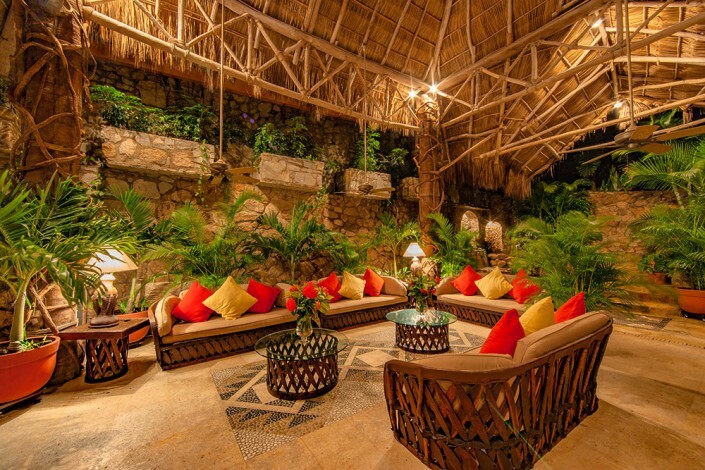 During this time, circumstances allowed him to bring to Puerto Vallarta a new sensibility to its local indigenous “environmental style”, making it less colonial and a more international, with an exciting “open” floorplan. 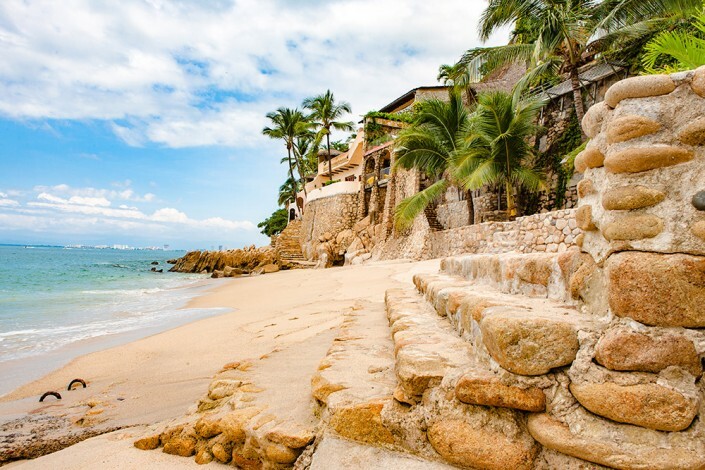 As preparation for her own house, Barbara Hutton had sent him to Japan to study that county’s elegant historical architecture. 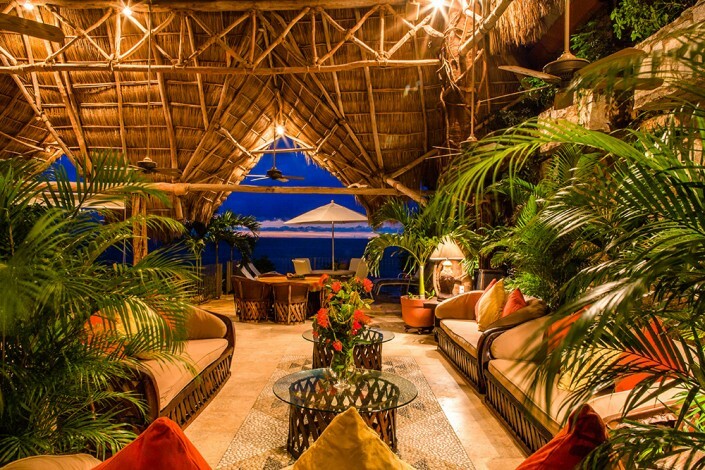 He later combined this Japanese sensibility with overstated Mexican craft materials of the area to create the quintessence of the exotic yet elegant romantic villa. 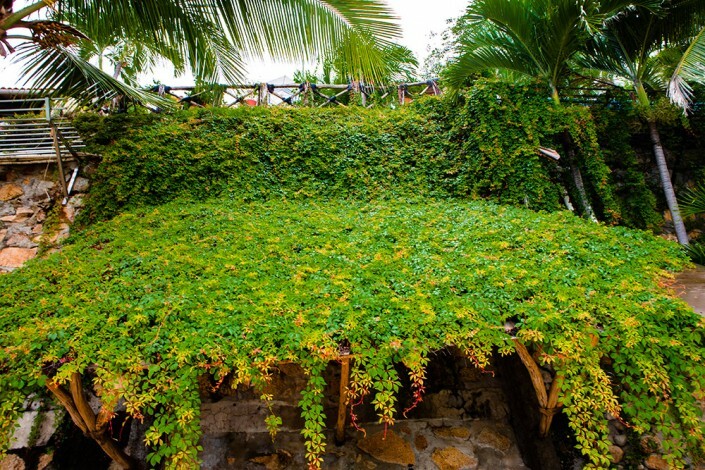 Unfortunately, Casa Cosmos is virtually the last remaining “environmental style” Terrazes house left in Puerto Vallarta. 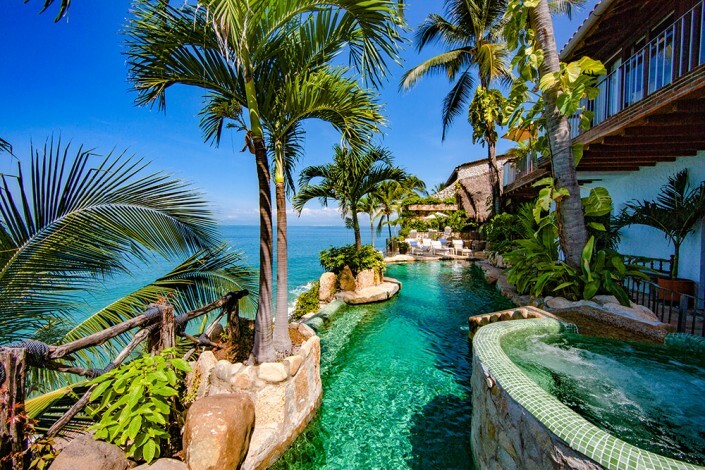 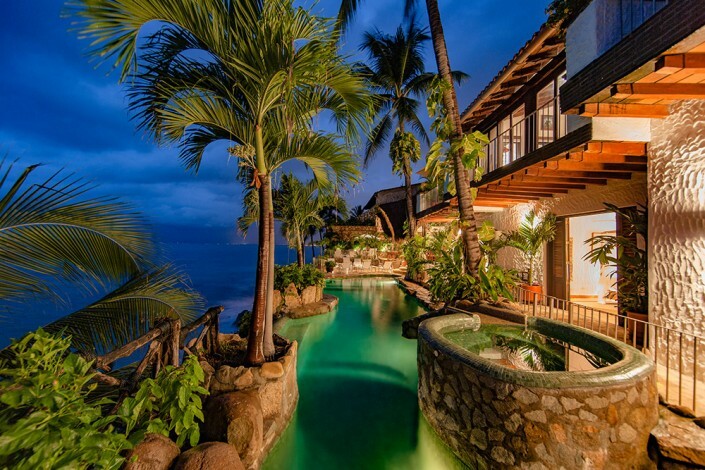 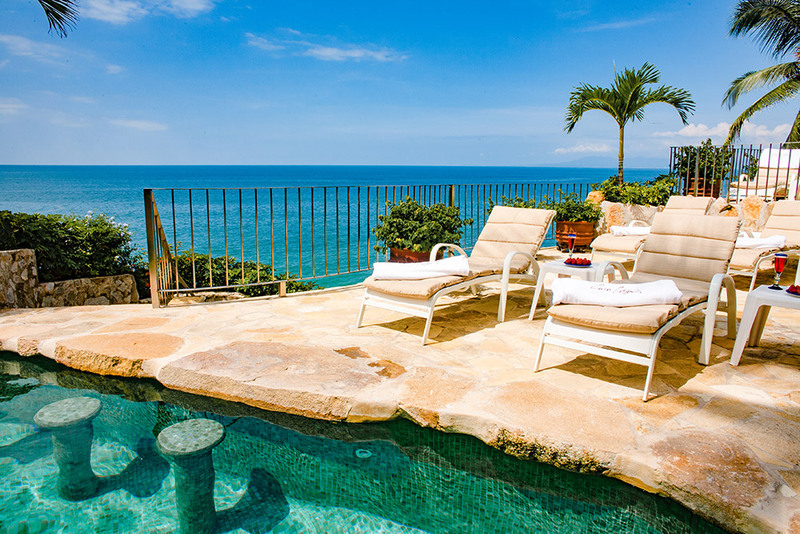 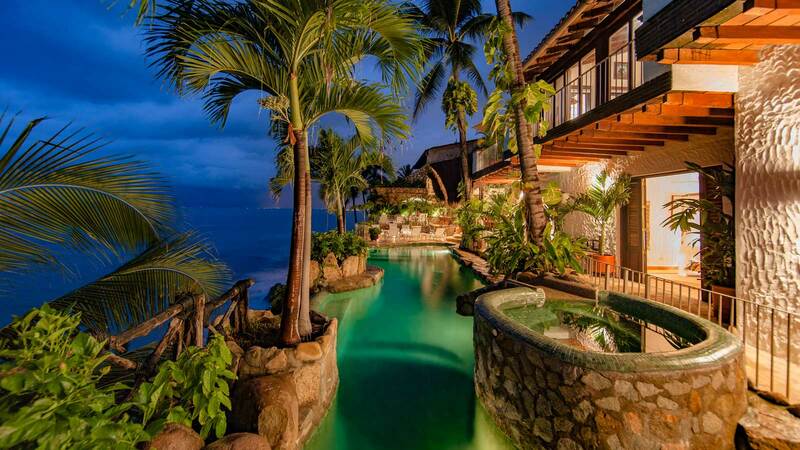 Over the last quarter century, many of the early Puerto Vallarta haciendas were simply torn down and replaced with more ‘predictable” Malibu or Beverly Hills styled architecture, including architect Terrazes’ long gone own spectacular cliff hugging villa and his sisters sprawling villa built on what is still the largest single family beach front lot in the area. By contrast, the new owners of Casa Cosmos during this time sought to modernize their property, not by tearing down, but by continuously updating and expanding inorder to honor and keep its original unique design. The overall feeling at Casa Cosmos has changed little since it was built over 40 years ago. Its panoramic southwest ocean view still orients toward the last remaining undeveloped jungle mountains of Banderas Bay, the same kind of unspoiled view enjoyed by the likes of John Huston, Elizabeth Taylor and Richard Burton each of whom constructed local houses after filming “Night of the Iguana” nearby in the 60’s. 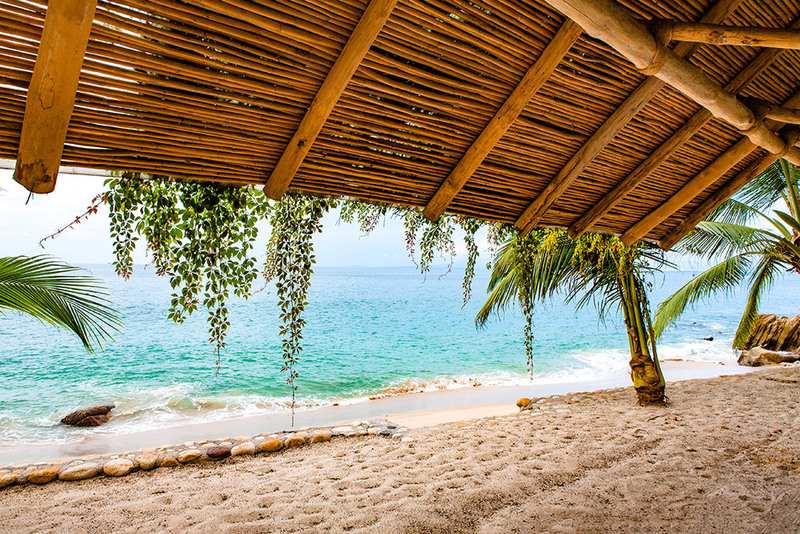 As then, the Casa’s own beach is usually empty and pristine. The Casa’s rooms are designed to enjoy balmy through ventilation, especially in its huge open-air thatch-roof living area (at 40 feet high, it is one of the largest “palapas” of any single Puerto Vallarta residence.) 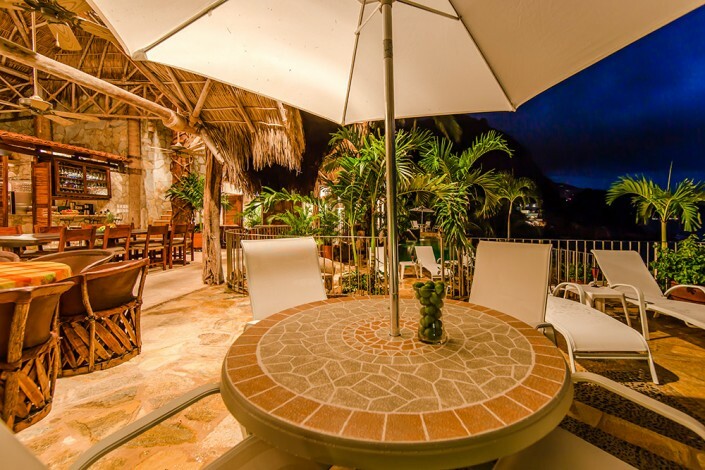 Casa Cosmos now has all the amenities of the many later “modern” houses while retaining the rustic ambience and charm of its then ground breaking Terrazes style. 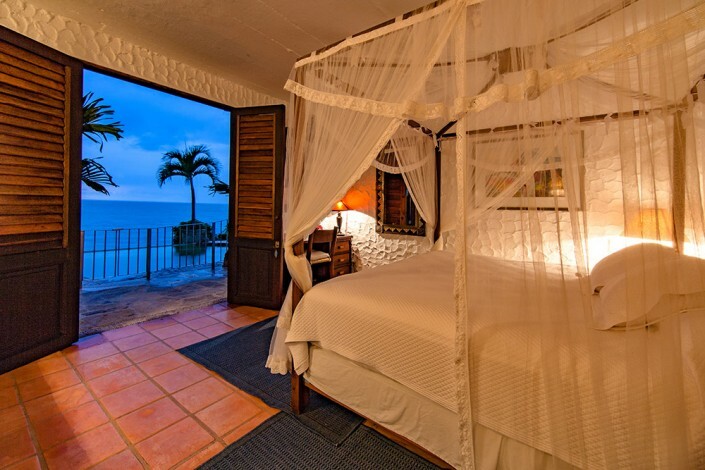 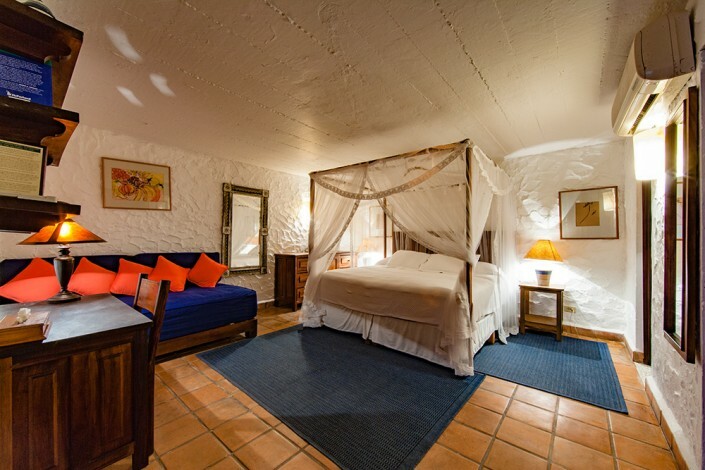 Today all the bedrooms have been retrofitted with air conditioning, although during the high season the natural ventilation design and refreshing ocean breezes render them unnecessary. 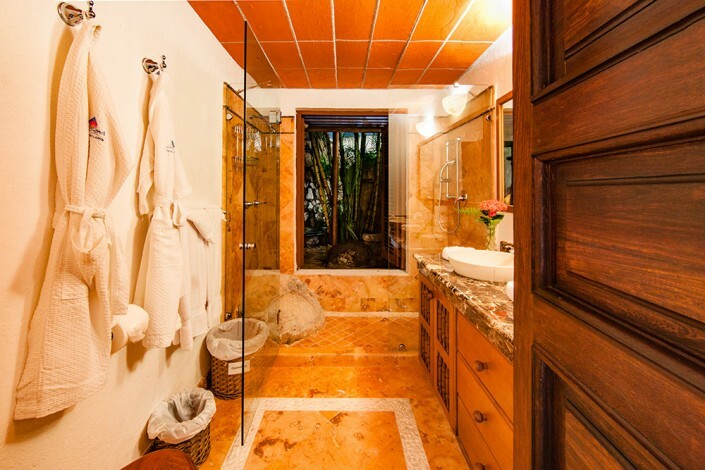 Each bedroom has its own private and recently remodeled marble bathroom. 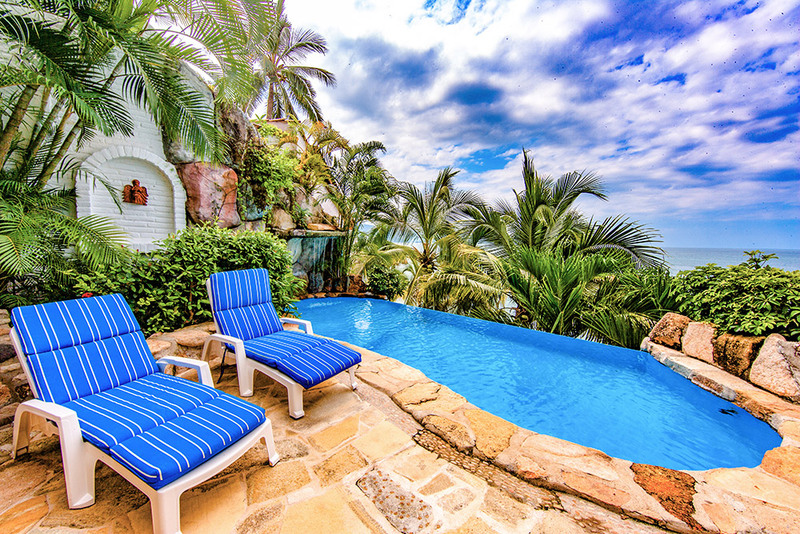 You have the options of two separate swimming pools: a secluded small private plunge pool and a solar heated 50 ft. long (lap size) rock grotto swimming pool with refreshing cool water Jacuzzi/water slide. (The pools now have kid friendly wading areas and unobtrusive baby gates.) 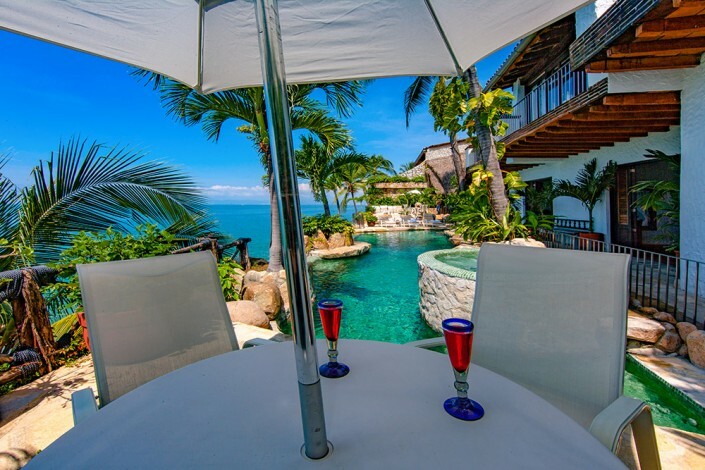 Much of the house is on one level with your bedrooms opening cabana style through oversized louvered doors to the main pool and sweeping ocean views beyond. Stone steps lead directly to your own private beach lounge area 35 feet below complete with rustic shaded overhang, palm tree hammocks, comfortable beach furniture and a couple of two person ocean kayaks ready for your use. 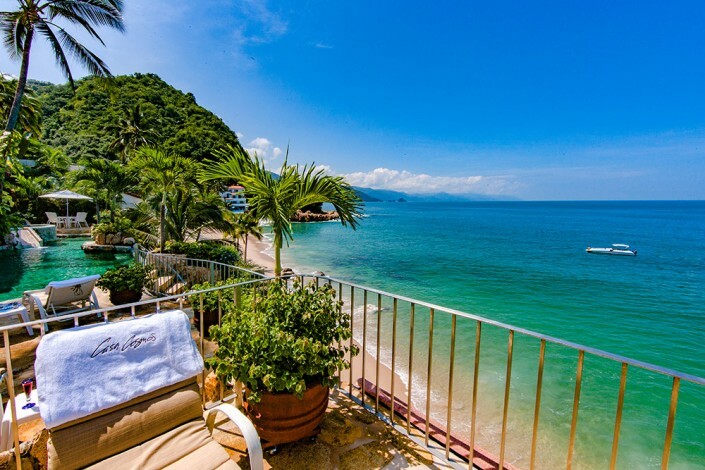 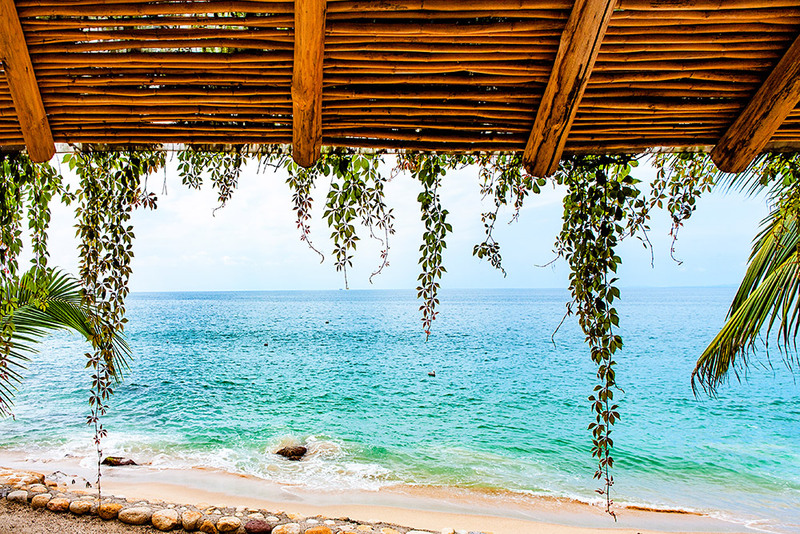 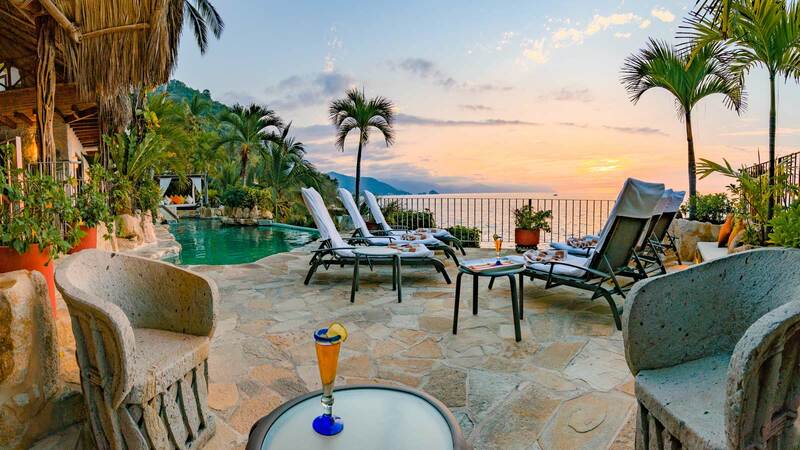 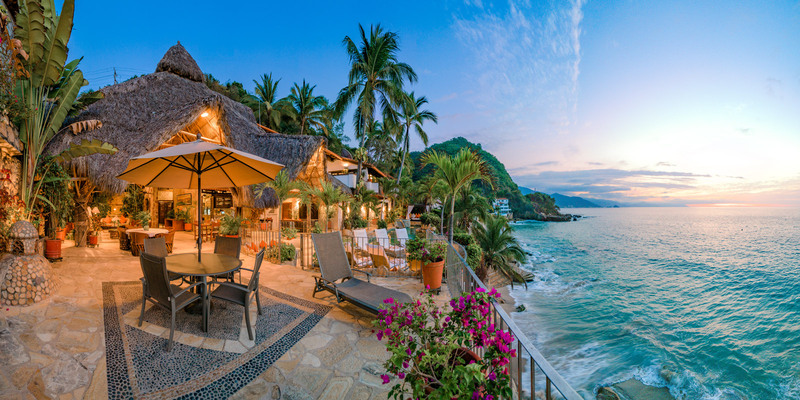 In fact, Casa Cosmos (and just 5 other houses) sit on arguably the only true private white sand beach in Puerto Vallarta, yet it is only 4 kilometers south of the bustling town center. No need to rent a car as plentiful and affordable taxis can be hailed right at your front gate, although most guests seem content to enjoy the Casa’s unique seclusion and stay entirely in residence. Included in the nightly rental is your own private staff of four; cook, daily maid service, houseman and groundskeeper. Maria Luisa, whose family has staffed Casa Cosmos for 20 years, lives in her own separate house on the property so you need not feel “abandoned” every night when the staff’s workday is over. 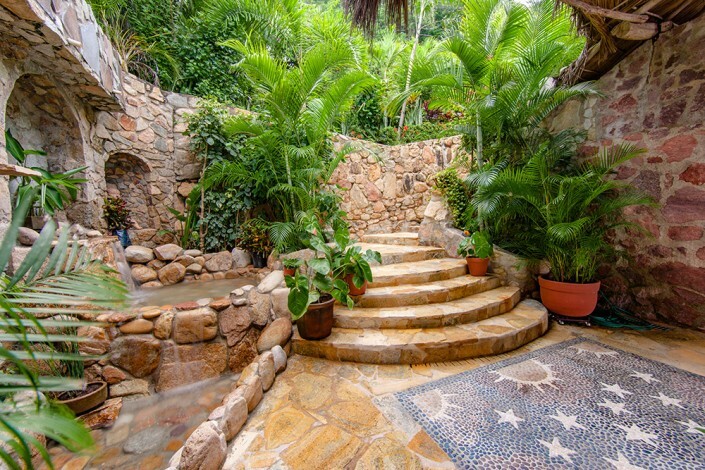 The grounds are entirely fenced in for both total privacy and security. 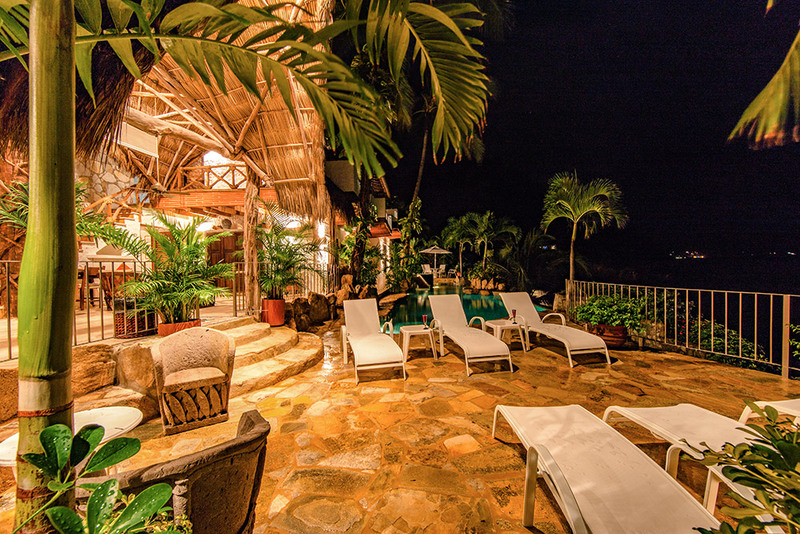 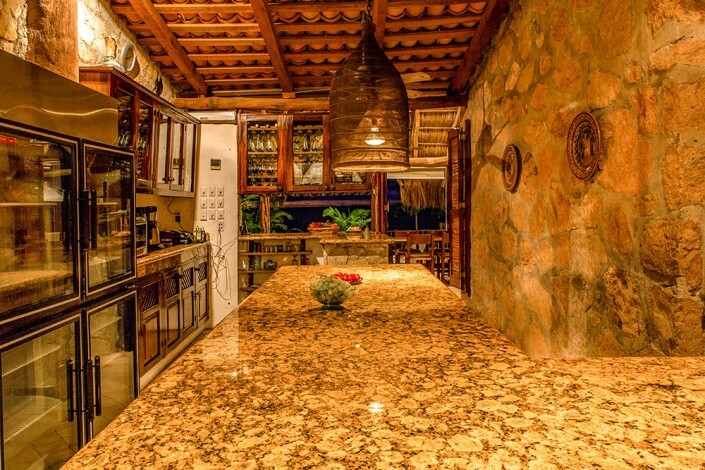 Casa Cosmos can be rented for just the size you want: starting with just four bedrooms it can be expanded to larger packages that can include an extra upstairs bedroom, a 4 bed dormitory and even the owners own luxurious 4 room “casita” with its separate kitchen and two private sundecks. 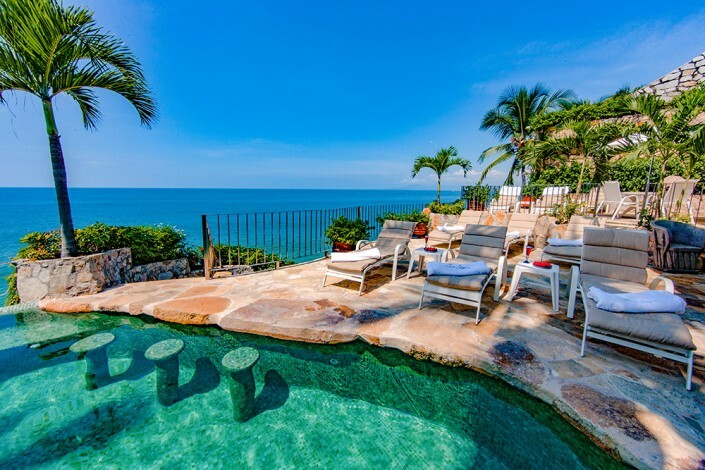 By the way, Casa Cosmos was featured in the Big Brother television show as well as in the movie the Domino Principal (1977) where Mickey Rooney was “shot dead” on the steps leading up from the beach.